Provider of imported Greek Extra Virgin Olive Oil, flavored olive oils, white and dark flavored balsamic vinegars and Greek Specialty items. Our Greek Mezzes ( Greek for “small bites”) include a selection of olives, Greek cheeses, homemade Spanakopita, Baklava, Dolmadakia, Tzatziki sauce and Rizogalo. We carry Gyro kits so you can make this Greek sandwich in the convenience of your own kitchen! In addition, we offer imported Greek olive oil soaps, Greek honey and raw, local honey. We carry a variety of spreads and tapenades that are not only great as a dip, but are awesome when used in cooking pasta, meat or seafood dishes. We have everything you need to make the ordinary taste extraordinary! 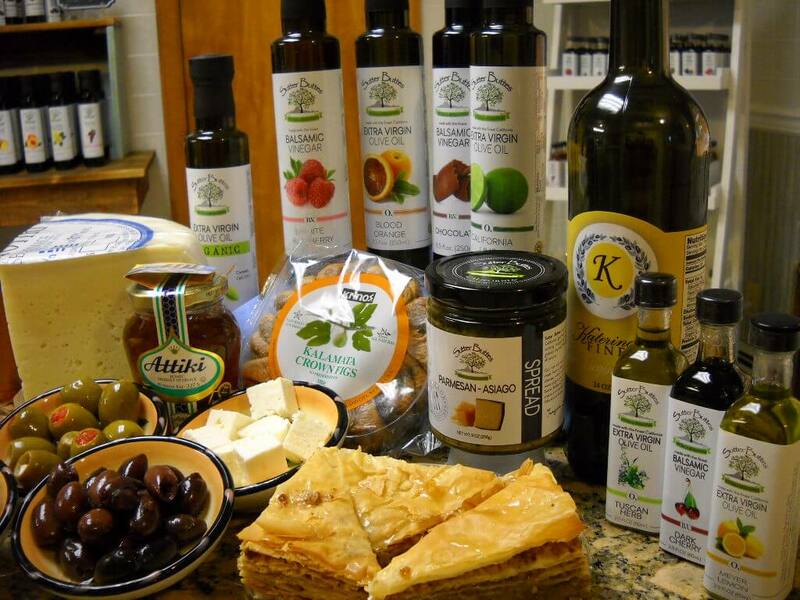 Some of their products include Katerina’s Finest Imported Greek Olive Oil, Sutter Buttes flavored olive oils, Sutter Buttes flavored Balsamics and a selection of spreads and tapenades that are great to put on crackers or use in cooking. The Aegean Table takes pride in their Spanakopita, Baklava and Rice Pudding. They also have a selection of olives, including Kalamata and Feta stuffed. They have both Feta and Kefalotyri cheese, along with Dolmadakia and everything you need to make a Gyro…Pita bread, Gyro meat and Tzatziki sauce.